I have just finished turning over my soil. 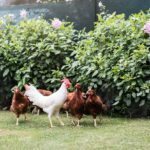 Would it be ok to scatter over some chicken manure now to get ready for spring planting? The manure is fresh and I know it can burn the plants.